The doors to the Past Times Café are set to open again this Autumn as the Cam Woodfields-based friendship group for older residents moves to a new venue in Springfields Court. 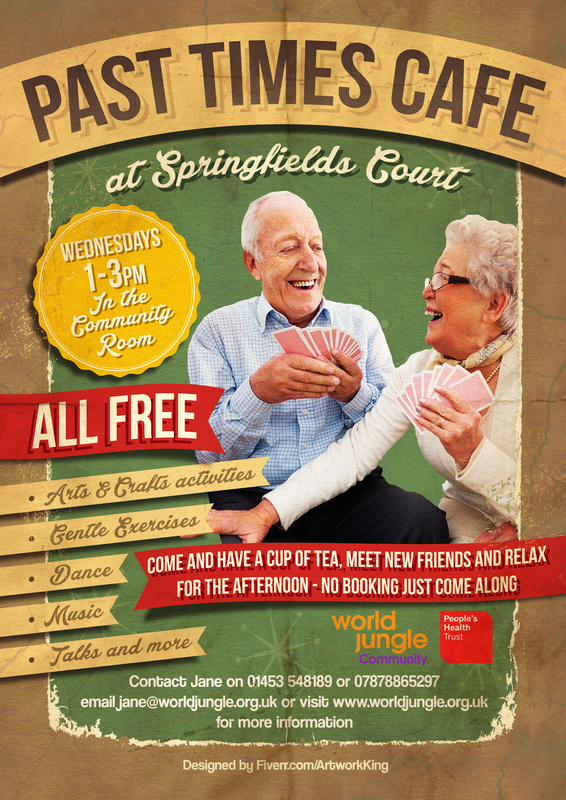 The weekly club which is free to residents of the Cam Woodfields area, will meet every Wednesday afternoon from 10 September, 1pm-3pm in the Community Room at Springfields Court in Cam. As well as enjoying a cup of tea and a chat with friends, there will also be different activities on offer each week including arts and crafts, gentle exercise, dance, music, reminiscence, knitting and talks. The friendship group is organised by local community organisation World Jungle and was made possible with funding from People’s Health Trust using money raised by HealthTotal through The Health Lottery. It aimed to help combat feelings of loneliness and isolation within the older sections of the community. Initially just planned for a short period, the group proved so popular with local residents that plans were put forward to extend the project and reopen the café this Autumn. “The Past Times Café has made a real difference to people’s lives, providing a welcoming space for people to get together socially and enjoy a range of activities. The benefits to how you feel just by getting out of the house, having a chat with friends, or getting to try something new, or go somewhere different, are huge. As the new series of the BBC’s ‘Strictly Coming Dancing’ hits our television screens this Autumn, you too can experience some of that ‘strictly magic’. So, if you’re ready to take to the floor and FitStep your way to a new you, just turn up on the day or contact Jane Manning for more information on 07878865297. All ages and levels of experience welcome. A second free taster session in Samba Drumming is organised in the Chantry Centre for the following week on Monday 15th September at 6.30pm-7.30pm. The free sessions have been organised by creative community organisation, World Jungle, as part of their ongoing work to promote the Chantry Centre in Dursley and encourage the local community to make more use of the venue. Let’s get arty and crafty this summer! Cotswold District Council’s Summer off the Streets Programme, run by World Jungle, has some exciting arts and crafts-based activities on offer this month. Age: 7-12 years. Join artist and illustrator Imogen Harvey-Lewis in this fast paced, dynamic drawing session. Tuesday 19 August, 10 am to 12 noon, Youth Centre, Fosse Way, Stow-on-the-Wold (£6 per ticket). Age 9 years plus. Fantastic fashion and costume making workshop using a variety of ‘found’ materials. Felt Making – Get creative! Age 7 years plus. Join local textile artist Pauline Chidlaw and have fun with fibres and colour, making a hand-rolled felt picture, a case for your MP3 player or mobile phone, or flowers to wear in your hair. FREE fun events this week for children across Cotswolds! Tuesday 5 August, 1pm – 4pm at QE II Field, Stow-on-the-Wold – lots of activities for all the family! CIRENCESTER FUNDAY – Celebrating National Playday! Wednesday 6 August, 1pm – 4pm at St Michael’s Park, Cirencester – a fun-filled time for the family! Friday 8 August, 10.30am-2.30pm at Deer Park School, Cirencester. Although this is FREE, participants (boys and girls) must be 8-15 years old and should please register in advance – see note below*. Sunday 10 August, 2pm-4pm, Adam Philby Skate Park, Tetbury – an afternoon of skateboarding competitions for children of all ages – features music, DJs, and graffiti demonstrations.